Health secretary Jeremy Hunt has admitted that it was a 'mistake' to cut the number of nurse training places in the last parliament. 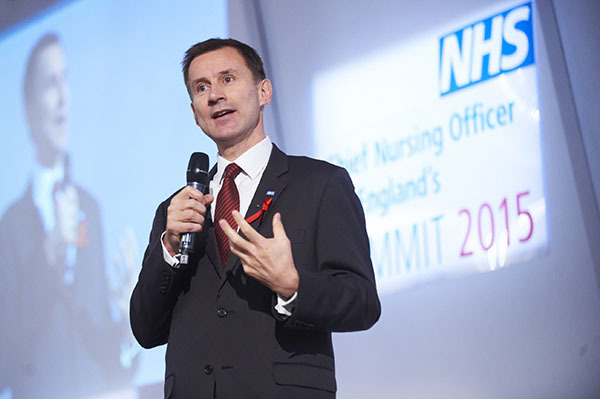 In a speech at the chief nursing officer (CNO) for England's summit in Birmingham this morning, Mr Hunt said it had been an error to reduce the number of places for nursing students five years ago. But he said there would be 23,000 more nurses in post by the end of this parliament in 2020. The health secretary acknowledged that the system ‘wasn’t working’ at present and said the controversial government move to scrap bursaries for student nurses in favour of loans will help to tackle high vacancy rates. In last week's spending review and autumn statement, chancellor George Osborne announced the shake-up to how nursing students will fund the fees for their courses. Concerns about the proposals were raised during a question and answer session following Mr Hunt’s speech. Unison head of nursing Gail Adams said the move could deter students from applying for nurse training places and said fees could leave future graduates with debts of £50,000. She also raised concerns that the current bursary functions as an incentive for nursing students and helps to encourage wider participation. But the government has said its plans will increase the amount of financial support nursing students can receive by up to 25%. Mr Hunt said: ‘If we get this right, we can see an increase in people from poorer backgrounds going into nursing. ‘Two out of three applicants for nurse places are not filled or are turned away. He said that one-third of nursing posts are filled by migrant nurses and although they do ‘a fantastic job’, he asked if this was the best long-term solution for the NHS and for the migrant nurses' home countries. Speaking to Nursing Standard, chief nursing officer Jane Cummings said the funding changes will mean universities can take more nursing students. Mr Osborne has said it will save £1.2 billion a year, which can fund up to 10,000 new training places.